Places to refuel and relax. informal meetings with colleagues or clients. We know how important the coffee is – and the other drinks we serve. We tailor our offer to your exact requirements. Perkee is our premium, sustainable coffee brand, produced in partnership with Bewley’s and the Soppexcca coffee co-operative in Nicaragua. With dark chocolate and caramel notes, Perkee coffee is made from single-origin 100% Arabica beans, grown in Nicaragua and roasted in Yorkshire. It tastes great, and you can feel good about its ethical origins. We also offer all the high street coffee brands. Raw & Ripe is our fresh fruit and vegetable cold-pressed juice concept. Simply choose from a selection of seasonal ingredients to get your ‘5 a day’. ‘Grab & go’ and all-day grazing are now hugely popular in the UK, with many people choosing to work at their desk for ease and speed. Our delis offer simple and premium sandwiches, handmade wraps, bagels, yogurts, dessert pots and healthy snacks. Our pastry chefs cook yummy cakes and pastries. 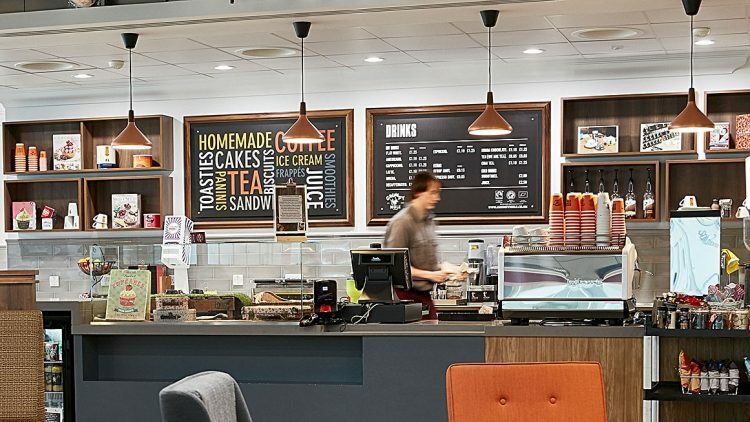 The choices in our cafés change throughout the day, so there’s always something different to try.